Stinkwheel Publishing was founded by David Beare in 2004 out of frustration with commercial publishers of historical works on cyclemotors, motorcycles, cars, tractors etc. more than a decade ago. None were interested or able to publishing niche books for a limited market on fascinating but outside of mainstream subjects, and with print runs of less than 1,000 copies. They all needed to print that volume of copies due to the limitations and economics of print technology at the time, which would mean a large pile of costly unsold books sitting around for years. Our average print run now is 200-300 copies per title as it is possible these days to print-on-demand (POD) small runs on digital presses. Interestingly, many publishers are now using this technology, so 13 years down the road a minimum print run of 1,000 copies is history. Computers and software have reached a level of sophistication and affordability where it is possible to write text, design layouts, embed images on pages and produce print-quality .pdf’s from an ordinary PC, ready for printing. Collaboration with our superbly supportive print-works near Ipswich, Suffolk, completed the circle. KDS Print & Design (Elder House, Chattisham IP8 3QE) was recently renamed Printing for Pleasure Ltd. (email- jason@printing for pleasure.co.uk) and continue to produce high-quality printed & bound books for Stinkwheel Publishing. I decided early on to use an A4 format, which lends itself well to larger reproduction of images than smaller page formats, and to print soft colour covers rather than expensive hard-backs, in order to keep prices down for readers of such niche publications. We have achieved this and made well-researched, readable books more affordable. Many motoring publications are now aimed at the prestige, hard-back with slip-case market, with high prices to match. With new digital printing technology available at Printing for Pleasure I can now include colour images distributed throughout the text, previously impossible due to costly litho-plates having to be made. The name Stinkwheel derives from 1930’s slang amongst motorcyclists for small-capacity, feeble two-stoke powered cyclemotors and autocycles which buzzed noisily but slowly around in a cloud of blue oily smoke- a stinkwheel. Our first two books were histories of such cyclemotors- The Stinkwheel Sagas, Episode 1 and 2, covering a short period after World War II when many manufacturers, small-scale and large (some of whom should have known better), launched themselves into making sub-50cc auxiliary engines to clip onto ordinary pushbikes and assist a rider up hills. Some came from reputable names such as BSA, Vincent, Ducati or Garelli. Others were individual efforts or from two-men-and-a-dog engineering works in a shed. Many exhibited technical ingenuity of a high order, with obtaining the most from the least the guiding principle. 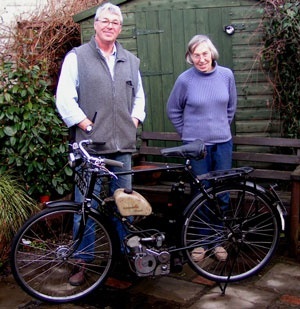 Author & publisher David Beare and collaborator Philippa Wheeler (Stinkwheel Saga Episodes 1 & 2) with a Ducati Cucciolo, the 50cc superbike of the 1950’s cyclemotoring era. Cyclemotors were never meant to last long and increasing prosperity from the mid-1950’s saw nearly all fade away, destroyed by a tide of fast, comfortable and reliable 50cc mopeds, many originating in Europe. Nevertheless a fair number have survived and are preserved and ridden by enthusiasts. Cyclemotors were one subject worthy of technical and historical study but would not sell many books, hence the establishment of Stinkwheel Publishing to produce works on subjects which could only be published in small print-runs. Our next book was on post-war Panhard cars, technically fascinating but commercially unsuccessful in Britain and now almost unknown, despite Panhard being a founder of the motor industry, winner of motor races from 1895 and maker of some of France’s finest grand routier cars for fifty years until Adolf Hitler put a stop to such activity. Panhard’s post-war cars were an entirely different breed; small, economical and relatively affordable. 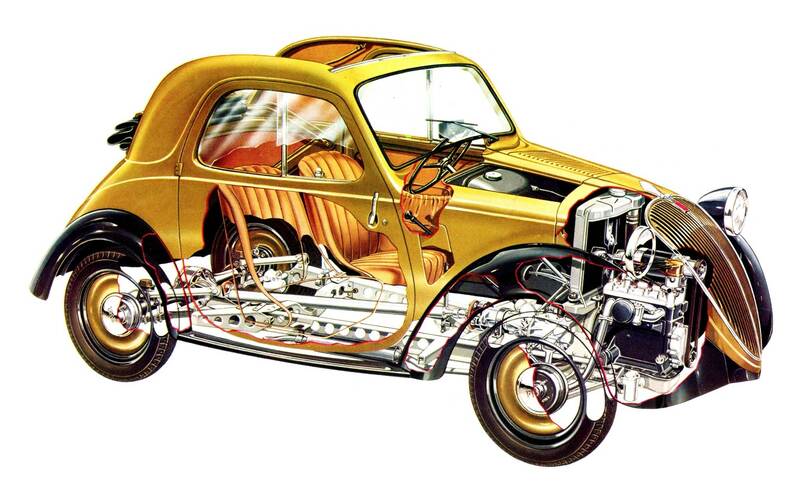 Panhard, the flat-twin cars 1945-1967 and their origins, is a history of the industrial, technical, social and political story of Panhard and France in the post-war years. Read some of the reviews by clicking on Publications and then Panhard. In November 2015 we published another niche motorcycle book, “The Wilfred Saga, Autocycle Adventures” which studies the brief but important and technically-interesting life of British autocycles. These were simple, low-powered, single-speed, pedal-assisted motorcycles of under 100cc capacity which came into being largely through a tax concession by Chancellor Phillip Snowden in 1931, reducing the cost of the “Road Fund Licence” for such machines. The licence required to ride one was also simplified, allowing many professional women such as midwives to give up pedalling to work and back. An autocycle was the most basic means of transport, very economical of fuel, which was why they proved so popular during WWII. Many reputable motorcycle manufacturers built autocycles; Coventry Eagle, Excelsior, Francis-Barnett, James, Norman, New Hudson and Rudge, to name but a few. By the 1950s the autocycle was an anachronism, overtaken by light 50cc European mopeds with multiple gears and modern styling, so they faded away, the last (New Hudson, made by BSA) finally ending production in 1958. January 2017 saw the publication of “Hispano-Suiza and Pegaso, Birkigt and Ricart, two men, two marques made in Spain”, Volume 1; see full details elsewhere on this website. Volume 2, “Pegaso and Ricart, From Hispano-Suiza to Pegaso; trucks, buses and sportscars” is scheduled to be published on the 4th December 2017 and is currently being printed. Full details will be added to this website by the end of November and it will be listed in the shop alongside Volume 1.